The herd has been let out of the barn...or should I say studio? Visit Ocala's Historic Square this evening and join the celebration. Five of the 27 horses will be displayed. "Horse Feathers" w on't be on the Square tonight, but you can take a ride out to Ocala Stud Farm to see him, 4400 SW 27 Avenue. He isn't right on the road, but you can go down the drive way a bit...and there he is. Yes, you have permission to get out and take photos. Please do not get onto the horse or put your little ones on his back for a quick photo. The fiber glass forms are not made to take the weight and the paint is fragile and will chip. Go to http://www.ocala.com/article/20110929/topic02 10/110929639 to see "Horse Feathers" up close and personal. Then go to http://ocala.com/article20110929/multimedia/110929619?tc=ix for an interactive map showing the location of each horse. Festival + Rain = ? The Thornebrook Village Art Festival was a challenge. Saturday was hot and muggy....surprising since last week's temps were on the cool side (for Florida that is). Lots of people turned out anyway. Sunday was pretty much the same with rain in the afternoon. As a result, the show officials allowed the artists to pack up about 3:30 pm. since patrons had already headed for shelter. Even with the weather issues this is a nice show. Everyone is always upbeat and pleasant and the whole weekend has a festive atmosphere. People do come out and buy which is an even bigger plus for the artists. I had several low end things go home with collectors and then this delightful young man got my attention saying "I want to buy that one". I reached for the small print I thought he was pointing to and he said "no, the really big one". Yep it turned out to be a great weekend! Art Festival at Thornebrook is this weekend Saturday Sept. 24 and Sunday Sept. 25, 10 am to 5 pm each day. This is a the finest small arts festival in North Central Florida. If you have not been to this festival you have missed some fun. Come on out and stroll the covered walkway and grounds of the Thornebrook Village Outdoor Mall in Gainesville, Florida. Visit me in Booth # 66 on the south side of the mall. The gift-giving holidays are upon us and I have new paintings and prints to fit everyone's budget. Something new has been added to give you more choices in prints: 8"x10" Fine Art Reproductions matted and ready for you frame. These are priced right and make wonderful gifts for teachers, friends and family. The week ahead is daunting: pick up the last two paintings from patrons for the Appleton Museum Exhibition , tweak a couple in my studio, finish painting the one I started yesterday, varnish, frame and label them all. The collection of approximately 37 paintings must be delivered to the Appleton Monday morning, Sept. 26. The exhibit opens to the public Saturday, Oct. 1 and runs through Nov. 20. I have been asked to speak about the collection on Friday night, Sept. 30 at the Member Preview Reception....oh my, always makes me nervous. 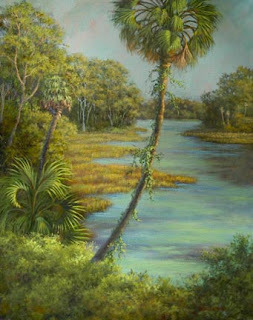 The "Rainbow Springs" painting posted here is in the exhibition. Show Festival season is here and my first one is this weekend at the Thornebrook Village Festival in Gainesville, Sept. 24-25. In addition to finalizing the Appleton Exhibition I need to put together the collection I am taking to the Festival. The herd of horses painted for the Horse Fever Project is to be unveiled and the artists introduced to the media Tuesday evening Sept. 20 at Signature Brands Corp. It will be exciting to see all the horses together, since only 5 are being shown to the public Friday, Sept. 29. This is a wonderful way to start the busy week ahead.....cool temps with a slight breeze blowing, birds singing, steaming cup of java as I read the morning paper on my patio. Yep, I still like to sit quietly and read a newspaper I can hold and turn pages. The last few months have been extremely hectic for me. But, I can only blame myself for over scheduling. I have a problem saying no, like many of you, which causes me to obligate myself to more than time will allow so I scramble to get it all done. Luckily I have an understanding husband, who after 44 years of marriage, puts up with me until the storm blows over. I started the summer re-inventing my gallery, changing the name to Sabal Palm Art Gallery and Studio, taking on 2 new wonderful partners and throwing a fabulous opening party with champagne flowing throughout the evening. All the time and work that went into publicity paid off with several articles and photos in the newspaper as well as each of the Ocala magazines. The gallery was packed and a number of paintings found new homes. Six Artists Six Prairies is a super project that I have been working on with 5 other professional artists. We are visiting and painting six prairies in the area with the goal of using our art to draw attention to Florida's unique prairies and the need to preserve them and to the importance of encouraging and supporting art and artists in the community. Look for our first show November 12 sponsored by Alachua Conservation Trust at Tuscawilla Cabin in Micanopy. A portion of the painting sales goes to non-profit conservation groups. Then came painting "Horse Feathers" for Marion Cultural Alliance's Horse Fever fund raiser. Painting a life-sized horse and learning to use acrylics at the same time was no easy task. MCA also invited me to participate in another fund raiser for the arts called Artist Within. I am paired with a super lady and have been working with her as she creates a painting for the final auction. One would think that was enough but nooooo, while all this was going on I was gathering paintings from several patrons around the state and creating new ones for my solo exhibition at the Appleton Museum of Art in Ocala. I had no idea that putting together a collection of over 35 paintings was such a big job. Thornebrook Gallery in Gainesville invited me to participate in a group show this month, of course I said yes. 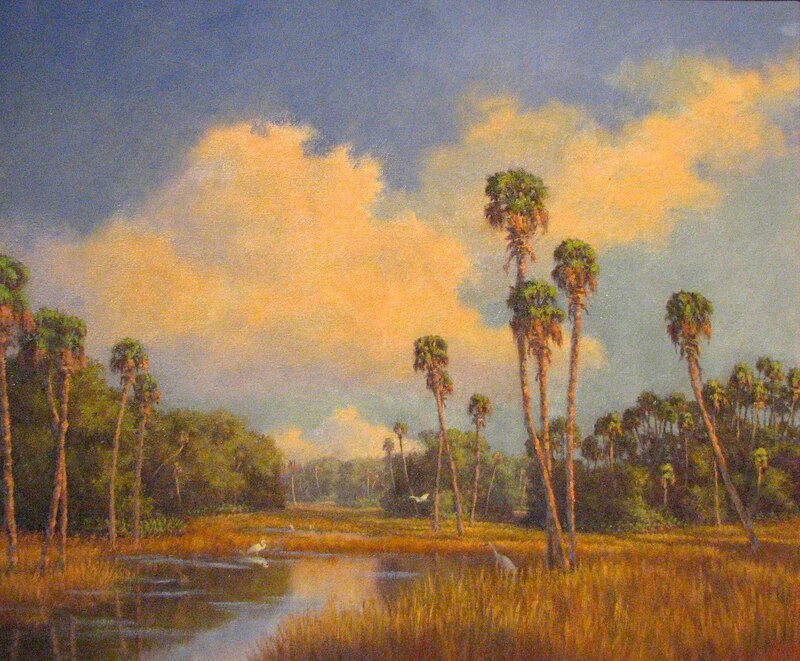 The Thornebrook Village Art Festival is coming up and Fine Arts for Ocala Art Festival is in October. Yes, you will find me at both shows. And that brings me to the holidays! I have plans for new Christmas Ornaments similar to the ones I made last year with Roseate Spoonbills on them. And, of course, all the other things planned for the gallery...you will hear more about that later. Don't get me wrong....I am not complaining just explaining. This weeks auction painting is all about alligators. 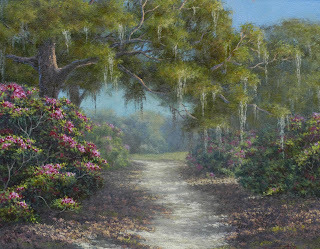 I painted it at Kanapaha Botanical Gardens in Gainesville, Florida. The birds and turtles saw him coming and scampered out of the way. Alligators are definitely prehistoric creatures. That thick, leathery hide provides great protection. They move slowly on land unless attacking a bite to eat. In the water they are graceful and glide through the water. Bids start at just .99 cents and shipping and packaging are FREE. The deadline to place a bid is 6 pm EST, Tuesday September 13.